Hyundai's nicely freshened 2018 Sonata mid-size sedan gasoline models will be joined soon by the new 2018 hybrid and plug-in hybrid versions unveiled at the 2018 Chicago Auto Show. 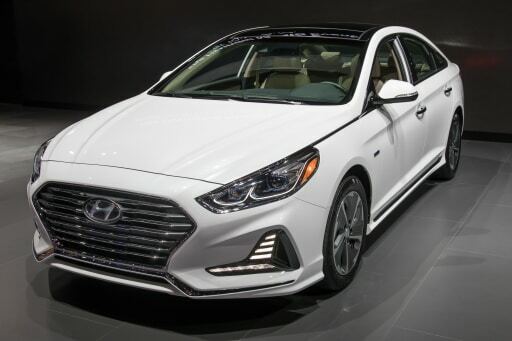 The electrified high-mileage models now will have the fresh face seen on the other models: a new front end with Hyundai's "cascading grille," stronger sculpting, bigger openings, vertical LED daytime running lights and reshaped headlights, with full LEDs optional. The most obvious differences with the gasoline versions, aside from some subtle badges, are distinctive flatter, aerodynamic 16-inch and 17-inch wheel designs. The hybrid uses a 154-horsepower, 2.0-liter four-cylinder Used Engines and a 38-kilowatt electric motor for a combined 193 hp, and it has a six-speed automatic transmission. Its 1.76-kilowatt-hour battery is packaged under the trunk floor for maximum cargo space and retention of the 60/40-split folding rear seatback. Hyundai estimates the hybrid models will be EPA-rated as high as 39/45/42 mpg city/highway/combined. The plug-in hybrid pairs the 2.0-liter four-cylinder with a 50-kW electric motor for a combined 202 hp; Hyundai estimates it will be rated for 27 miles of all-electric range and that its 9.8-kilowatt-hour battery can be fully charged in about three hours on 240 volts. The hybrid will be on sale by April nationwide. The PHEV goes on sale in the spring and generally will be available in California, Connecticut, Maine, Maryland, Massachusetts, New Jersey, New York, Oregon, Rhode Island and Vermont, and as a special-order model in other states.